Grégoire Canlorbe: It is not uncommon to claim the self-assertive longing for “prestige,” “respect,” and “fame” is fully intelligible within the framework of the selfish-gene theory, according to which the individual is biologically designed to propagate his genes—and therefore, to pursue personal survival, reproduction, and kin solidarity. Despite the Indo-European warlord’s disdain for his own biological survival, and despite his heroism being recognized and praised by people who are not necessarily related to him genetically, do you still subscribe to the universal relevance of the selfish-gene framework? Darwinian selective pressures are always at work. But this should not be taken to mean that human culture does not have its own internal dynamics, and that all our beliefs and behaviors are explainable in Darwinian terms. Evolutionary psychologists (not MacDonald) can be quite presumptuous in their fundamentalist belief that they can instruct sociologists, philosophers, and members of the humanities, about human nature and the ultimate origins and biological foundations of our cultural practices. They like to emphasize the cultural patterns, institutions, customs, and beliefs that occur universally across many cultures, as a demonstration that humans will only engage in cultural practices that are good candidates for evolutionary adaptations. It is worth noticing, however, that the examples of cultural universals they offer — such as the universal presence of athletic sports, dancing, music, housing, funeral rites, language, greetings, courtship, calendars, division of labor, status differentiation, tool-making — are examples of basic cultural practices performed by everyday humans. They represent the lowest cultural denominator. They can’t account for the superlative achievements of Europeans in music, the fact that classical music is singularly European, in evolutionary terms. They can’t account for the fact that almost all the greatest thinkers are European, the architectural styles, the invention of sports, etc. Their inclination, rather, is to trivialize high culture and high achievements that are not easily fitted into an evolutionary scheme. Richard Dawkins defines the term meme “to refer to the ways of doing and making things that spread through cultures.” Dennett realizes that many selected memes have not enhanced human fitness, and that in fact “many of our most cherished memes are demonstrably fitness-reducing in the biological sense,” such as postponing procreation to get a very expensive college education. Once we meet our survival needs, humans “think there are more important things in life than out-reproducing their conspecifics.” “We are the only species that has discovered other things to die for (and to kill for): freedom, democracy, truth, communism, Roman Catholicism, Islam, and many other meme complexes (memes made up of memes).” We are the only species that articulates reasons to account for why we do things and the only species that attempts to persuade others why those reasons are good, often in the name of goals that cannot be accounted for in straightforward evolutionary terms. They have also argued that human cultural activity has changed the environments they respond to, creating “cognitive niches” or “cultural niches” with very different selective pressures. Pinker believes that humans evolved sufficient genetic capacities to be able to select the best memes and discard culturally inefficient or dysfunctional memes. Cultural evolution can thus be said to have evolved away from the undirected evolution by natural selection toward the production of memes chosen with foresight and comprehension. Dennett sees no reason why we need to attribute human intentionality and comprehension to the selection of competent memes, because we can’t possibly access our own thinking, what transpires inside our brain, the exponentially complex chain of causation links, when we claim to know the reasons we do things. Therefore the conscious “I” cannot be said to have generated the comprehension we associate with the selection of memes. We must learn to think of what goes on inside the brain in the same way we think of computers performing competent tasks without conscious awareness. If we are to offer scientific reasons or explanations for the selection of competent memes, we should do it in the same way that we offer explanations for every other purely physical process. There is no need for taking the first-person point of view. The only way we can provide a scientific explanation is by examining the brain from the outside, in the third-person point of view of scientists. Having tried to be as fair as possible to the Darwinians, I will offer a few minimal counter thoughts. I have noticed that, however much Pinker and Dennett acknowledge the role of culture itself in the evolution of memes, they are inclined either to trivialize cultural achievements outside the sciences or identify them as “gratuitous but harmless decorations.” They much prefer to concentrate on “innovations” that can be fitted straightforwardly into a selective process. But cultural achievements, including why men die for freedom and for religious beliefs, can’t be defined as mere technical “competences” or as inefficient or “gratuitous decorations” for the sake of pleasurable moments. Dennett ponders over the fact that all the cultural genius he lists are males, why “there have not yet been any female superstar geniuses”. He offers no answer except to suggest that the answer may lie in the process of cultural evolution. But it should also be noted that every single outstanding cultural achiever he mentions, including every single major innovation, was European or occurred inside Europe. If this is so (and ignoring genetic differences between Europeans and other peoples that might well be relevant), why should the answer not lie in the process of Western cultural evolution? Almost every academic he mentions in his book—countless cognitive psychologists and scientists—also happen to be working inside the West. Bennett can go on offering brilliant third-person explanations that lie well beyond my comprehension and competence. I will only suggest that self-consciousness, consciousness of consciousness, out of which cognitive psychology emerged, was strictly a Western invention. If we agree that in the evolution of consciousness, from the “rudimentary sense of self” Dennett detects in single-cell organisms, in their self-maintenance, energy acquisition, and reproduction, through to the ever higher grades and shades of “awareness” we find in multicellular organisms, through fish and then territorial vertebrates, with their radically new design systems for survival in whole new niches demanding more central control and new capacities of sensory awareness, perception, and working memory, to the higher awareness of self-monitoring, mindreading, autocuing, and self-recognition of enculturated apes — if we can agree that in the evolution of consciousness we can identify increasingly higher levels of consciousness, and that eventually humans constructed themselves through cultural evolution, so that the range, shades, and dynamics of human consciousness can no longer be said to be biologically given but depend on the culture constructed, why can we not distinguish human cultures according to the level of awareness they have exhibited? Why can we not say that Europeans set the bar of self-consciousness higher than any other people? Why should we not ask about the cultural origins of the higher level of self-awareness of Europeans, rather than asking only about the emergence of human consciousness? It would have been more accurate for Merlin Donald to say that Western culture assumes an elevated level of awareness because Western culture engendered the highest levels of awareness starting with the Indo-Europeans and with the ancient Greek discovery of the mind. I will conclude answering this question by asserting that it goes against the entire history of cognition—as well as actual intellectual developments, the history of science, mathematics, psychology, physics, chemistry—to be satisfied with the degree of consciousness found in Upper Paleolithic peoples and all non-Western civilizations, which never reached the stage of Piaget’s formal operational thinking and which, in the case of China and the Islamic world, stagnated intellectually after the Bronze Age; i.e., after about 1300 AD. Europeans reached a higher level of consciousness beginning with the ancient Mycenaean or Homeric Greeks for whom the highest value in life was honorable struggle to the death for pure prestige, leading to the discovery of the faculty of the mind, and an increasing awareness of their own agency as human beings capable of understanding the workings of the world in terms of self-determined or rationally validated regularities coupled with a growing awareness that man was the measure of all things, a subject with a spirited will-to-be-conscious of himself as a free subject, rather than a mere object of nature and mysterious forces, but a subject who takes himself to be the “highest point” on which all else depends. But this self-consciousness was in its infancy in ancient times and it would take many cultural revolutions all the way to German idealism during the 1800s for a full account of how the “self-conscious I” can be shown to lie at the very basis of all knowledge—and beyond this outlook to develop a philosophical-historical account that demonstrates a full awareness that this self-conscious I was self-generated only within the particular cultural setting of Western Civilization. Grégoire Canlorbe: You do not hesitate to challenge the Alt-Right’s animus against Protestantism, which has been commonly perceived as a puritanical and factitious spirituality; and as the expression of a plebeian resentment against social inequalities and chivalrous feelings which are linked to any noblesse worthy of the name. In view of the founding texts of Protestantism, and in view of the type of society given birth to by its historical development (in America and other countries), how do you assess this line of criticism? 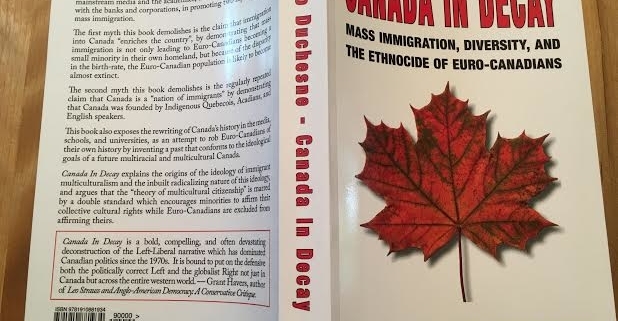 Ricardo Duchesne: I take it you are referring to an article I wrote at The Council of European Canadians with the title, “Should the Protestant Ethic Become the Spirit of the Alt Right”? I can barely claim knowledge about the Protestant Reformation and about the religious beliefs of the many denominations and sects that grew out of this Reformation. I know something about Hegel’s assessment of the historical import of Protestantism, and about the controversy surrounding Max Weber’s famous essay, “The Protestant Ethic and the Spirit of Capitalism.” There is much to be learned from Hegel’s and Weber’s assessment of Protestantism. Hegel interpreted the Reformation, specifically Luther’s writings, as a call upon individual persons to take responsibility for judging what is true and morally right. He saw Lutherans as advocates for the liberation of the inwardness or conscience of individual believers from the unquestioned authority of priests, for the priesthood of every believer, a call which encouraged the eventual use of reason as the ultimate standard for what is truthful against all externally imposed authorities. Protestantism, however, still subjected reason to divine authority as expressed in the Bible, and, in this respect, for Hegel, it was a qualified conception of freedom of conscience. The Lutheran view still demanded obedience to a divine will beyond reason. So, while Protestantism liberated European consciousness from the externality of Catholicism and the authority of priests, the subject still remained in the presence of an abstract God in heaven beyond this world, rather than actualized in the world. It was only after the principle of freedom of conscience freed itself from its purely religious character and made its mark in the worldly sphere, that the freedom achieved in religious consciousness becomes concrete, and this started happening only with the Enlightenment subjection of secular society and history to rational principles. Following Hegel, I don’t see the Reformation as a “plebeian resentment.” I welcome what Charles Taylor has identified as the Protestant “affirmation of ordinary life.” This affirmation of ordinary life, along with the relative devaluing of the classical and medieval aristocratic ethic of military honor and intellectual contemplation, involved a new sensibility to work and family life. Work and household chores were new values central to our well-being, activities which should ideally be performed in effective ways with dignity and without suffering. Knowledge should not be pursued for its own sake, but should also be used, in the words of Francis Bacon, “to relieve the condition of mankind.” Protestant reformers dignified the everyday, the bodily, and the homey lives of mothers, fathers and children. This was a radically new conception from the Greek-Roman attitude that saw the family primarily in terms of the public duties it had to the state in the rearing of loyal children. I am not going to get into the exhausting literature about the “strong” and the “weak” interpretations regarding the influence of Protestantism to the rise of modern science, except to say there was a relationship. Easy talk about how Protestantism was responsible for secularism, social levelling, rise of bourgeois values, and eventual erosion of European identity, needs to take into account the positive historical role of this side of Christianity. My main point in that essay on Protestantism and the Alt Right, was, if I may paraphrase here, that the importance of Weber’s thesis goes well beyond his effort to connect the development of rational capitalism with the Calvinist doctrine of predestination. We can read his argument to mean that only Western men, among all religious believers in history, promoted a “this-worldly” religion, which introduced a drive to mastery in worldly affairs by means of a systematic ordering of every aspect of one’s life, starting with self-mastery over “everything impulsive and irrational, the passions and the subjective interests of the natural man.” While Eastern religious men were contemplative in orientation, preoccupied with transcending worldly affairs, or reaching a harmonious coexistence with the world as it was, the Protestant sects of Calvinism, Methodism, Pietism, and Baptism called upon believers to gain mastery of this world through the “deliberate regulation of one’s life,” disciplined and methodical work, rather than to find salvation out of this world. Weber was right that the incredible success of Europeans in the modern era was made possible by a type of personality no longer interested in the “undisciplined” acquisition of wealth “without reserve and as an uncontrolled impulse.” The aim of the Protestant way of life was to produce a new type of character able “to bring order into the conduct” of his life, “a cool self-control and frugality,” to achieve the highest return for each hour. It was only by making their Faustian restlessness “thoroughly rationalized,” freed “from the power of irrational impulses,” that European men came to master the world in the nineteenth century as never before. To be sure, the incredible success of Europeans brought them unparalleled affluence and easy comfort after World War II, coupled with the evaporation of any notion of a “calling.” The capitalism of frugality and savings came to be replaced by a new form of Keynesian capitalism driven by effective demand, consumerism and welfare spending. It seems impossible now to resurrect the Calvinistic ethos Weber so admired. But if we can find a way to think of this ethos without the religious beliefs accompanying it, we may be able to extract some eternally valid precepts for the restoration of European greatness. Grégoire Canlorbe: The presence of identifiable (instead of anonymous) characters living according to an ethic of individual glory and achievement is not unique to Mycenaean literature. The Old Testament features an ensemble of heroic and individualized characters—let one think of Moses, David, or Samson—who have nothing to envy to Achilles or Odysseus. Should this lead us to include the ancient Hebrews among the Indo-European peoples? Ricardo Duchesne: I would not say the characters of the Old Testament live according to an ethic of individual glory and achievement, although it can be said that the Bible is full of “individualized characters.” However, it is hard to think that they are “aristocratic individuals” in the way I define that term. The significance of the Old Testament, its world historical import, is best captured through the argument that the Jews, along with the Chinese, Indians, Greeks, and possibly Persians, were progenitors of a “new axial age.” This idea has been attributed to Karl Jaspers. He believed that a dramatic spiritual revolution occurred in the Old World, led by Confucius, Buddha, the Hebrew prophets, and Greek philosophers roughly between 800 and 200 B.C. According to Jaspers, during this period, itinerant intellectuals—intellectuals acting outside the normative order of centralized priesthoods and independently of rulers seen as divine or semi-divine authorities— began to promulgate a new ethics based on argumentation or reflexivity, formulating transcendental ideals which came to serve as absolute moral platforms to judge secular authorities. In the case of the Jews, they gave Israel a higher law that liberated it from submission to any earthly ruler. The best defense of the idea of an axial age is Robert N. Bellah’s Religion in Human Evolution: From the Paleolithic to the Axial Age (2011). Bellah makes an excellent case for the reality of an axial age, but as he admits reluctantly, it was only in ancient Greece that a “theoretic culture” emerged, that arguments inherently open to further rational reflection were proposed, in that these arguments were based on rational premises inviting rational criticism. Bellah is unwilling to follow through with his awareness that only in ancient Greece, as Donald Merlin argues, can we speak about new norms and meanings centered on human argumentation—“thinking about thinking.” In this respect, I would add that only the Greeks set the groundwork for true transcendental thinking, a thinking that relies solely on what reason validates and is unsatisfied with norms and ideas promulgated by ancient intellectual authorities, but always ready to dethrone them. Bellah also stops with the axial age, wanting us to believe that this was the culmination of reflection, which is true only for the Hebrew people, the Chinese, and the Indians, but not for the Greeks or Europeans generally, who were only starting, bringing forth in subsequent centuries a continuous sequence of novelties and revolutions in all spheres of human life. Grégoire Canlorbe: Thank you for your time. 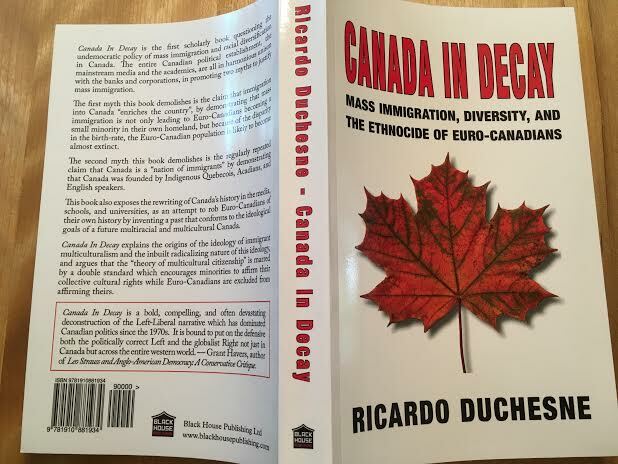 Would you like to add a thing or two?Ricardo Duchesne: Thanks for the great and demanding questions. I am well aware that the claims I make here will require a lot more work than what I have published. Kevin MacDonald, “Going Against the Tide: Ricardo Duchesne’s Intellectual Defence of the West.” The Occidental Quarterly 11.3 (2011), p. 51. Cited in Denis Dutton, The Art Instinct: Beauty, Pleasure, and Human Evolution (Bloomsbury Press, 2009), p. 95. Steven Pinker “Art and Adaptation” in Brian Boyd, Joseph Carroll, and Jonathan Gottschall, eds. Evolution, Literature, and Film: A Reader (Columbia University Press, 2010), p. 126. These quotes come from Daniel C. Dennett, From Bacteria to Bach and Back: The Evolution of Minds (W.W Norton, 2017). See Yadarius Run Fast with a Ball. That was superb, especially the part about the indo-european steppe aritstoi. Fits in with “Under the Shadow of the Sword,” a history of islam and roman empire I’ve been reading recently. What’d be truly great is Duchesne’s ouvre published free of charge by the too, online, kinda like the mises institute used to do. @ M: I second that. A free, online version would ensure the work gets the diffusion it deserves and would still leave the paper version for gifts or for those who prefer the tactile experience of a book. The goodwill would be significant.